Irish soap is made with sweet lavender along with natural vegetable oils. 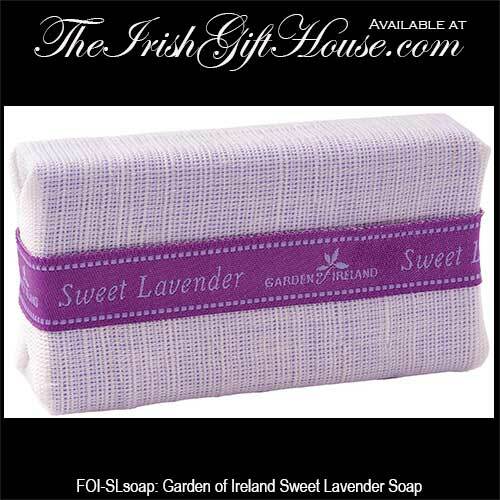 The sweet lavender soap is wrapped in pure Irish linen that may be used as an exfoliation cloth. The natural vegetable oils used to make the sweet lavender Irish soap are gentle on the skin and the subtle blend of lavender and spices have the ability to calm to the mind and relax the body. Each bar of sweet lavender soap weights 125grams (4.4 ounces) and is made in county Wicklow, Ireland by the Garden of Ireland. Irish soap is made with morning rose along with natural vegetable oils. Irish soap is made with heather and moss along with natural vegetable oils. Irish soap is made with honey and oatmeal along with natural vegetable oils.